Drivers, pilots, and households are routinely able to set increasingly sophisticated systems on autopilot, thanks largely to the layering of multiple breakthroughs in separate domains like voice recognition, image classification, and sensors. 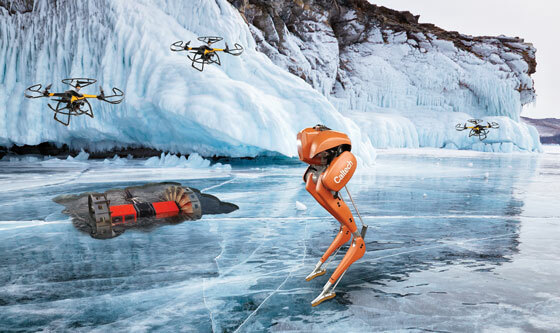 The conversation about how to carry autonomous technology forward across disciplines and applications has had a natural place in the Division of Engineering and Applied Science. The question has been how to best approach autonomy from the start. The answer has meant identifying autonomous systems as a research priority for the EAS Division, creating a space for autonomy to come into its own and resisting the trend to treat it as an add-on to any other engineering discipline. Instead, EAS has managed to create a nexus between the departments of aerospace (GALCIT), mechanical and civil engineering, electrical engineering, and computing and mathematical sciences. When considering the next generation of these technologies, Mory Gharib, Hans W. Liepmann Professor of Aeronautics and Bioinspired Engineering and Director of Aerospace and the Center for Autonomous Systems and Technologies (CAST), defines the emerging autonomy as post-navigator: “These are systems that do not require an operator, or any third party, to make decisions to successfully navigate and safely achieve their goal while negotiating dynamic conditions,” he explains. Housed within GALCIT, CAST operates as an interdisciplinary center dedicated to the study of this new frontier: the emerging unknowns of the engineering of autonomous systems. The new center brings together researchers from EAS, JPL, and Caltech’s Division of Geological and Planetary Sciences in a state-of-the-art, 10,000-square-foot facility where they can work alongside experimental machines—build and test robots and drones, for example—to advance bioinspired systems, autonomous exploration, and other related fields with a range of important potential applications. Establishing a research program surrounding systems that do not yet exist requires a collaborative environment, with room for large teams to conduct research along with sophisticated testing facilities and a highly integrated educational model. “EAS has always pushed the boundaries of breakthrough research while educating the leaders of the future. The result is a culture that attacks the unknown with fundamental science,” says G. Ravichandran, John E. Goode Jr. Professor of Aerospace and Mechanical Engineering and the Otis Booth Leadership Chair of the EAS Division. “By clearing a space and building a dedicated specialized home for autonomy, the aerospace department grows beyond itself, making way for more universal applications of the systems it has influenced for decades.” Gharib concurs. “Engineers and applied scientists from across Caltech and JPL now have a venue for collaboration that will have real and significant impact outside our immediate academic world,” he says. “This research will undoubtedly affect science, culture, and society. Making sure research of this magnitude has a dedicated space is an important expression of the EAS Division’s commitment to the exploding field of autonomous systems.” This commitment also extends to Caltech trustees Lynn Booth and Kent Kresa, who recently endowed the Booth-Kresa Leadership Chair for CAST. ENGenious brought together some of the key faculty collaborators of CAST to hear how they use this new space and its specialized testing facilities and how the evolving structure of that research is redefining what engineering education means at Caltech. Research on autonomy within EAS is mission-driven and oriented around shared “moonshot” projects. Each of the moonshots—mapped out thematically as Explorers, Guardians, Transformers, Transporters, and Partners—is an ambitious, innovative, and interdisciplinary endeavor designed to capture broad tracts of fundamental research throughout its development. Like their namesake—the challenge of sending Americans to the moon in the 1960s—CAST’s moonshot goals will require advances in engineering to accomplish currently impossible feats. 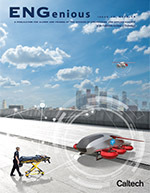 Among these is the development of a robot that can walk from Mexico to Canada without assistance, other than being guided by a network of flying drone scouts; another project is the construction of a flying ambulance capable of delivering an injured person to first responders without a pilot. The moonshots are fundamentally about helping: placing humans and machines on a team together to better navigate, monitor, survey, communicate, deliver, and assist in all manner of dynamic conditions. Under this model, the various engineering disciplines function democratically, with no one academic niche taking precedence. According to Gharib, this is the way to move past the traditional camps of hardware and software and set up systems more like the human body does. “It is a mind-body vision,” he explains. “We are all critical, and each moonshot mandates the participation of multiple experts. The point of interface between the minds and the bodies of these systems is where the engineering will break out of one department and radiate throughout the Division and into our world.” This potential for greater world impact is also recognized by the corporate and industry supporters of CAST, including Raytheon and AeroVironment. 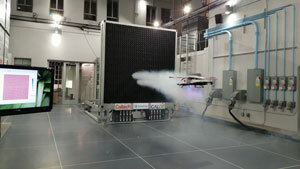 Another world-class physical feature of CAST is Chung’s space robotics lab on the basement levels of the building. This near-frictionless environment allows his students to test physics-driven designs for spacecraft in three dimensions. This “flat floor”—the largest in academia, surpassed only by those held by NASA—is the kind of specialized facility that allows for advanced, efficient development and testing. Research currently underway in this lab, in partnership with JPL, will further the Transformers moonshot: A mini model asteroid, affectionately known as “the potato,” is serving as the visual unknown target for a swarm of space drones that are learning to characterize the size, weight, shape, and motion of foreign objects using onboard sensors. A swarm offers the advantage of exponential improvement in the precision and speed of the characterization of the target object. 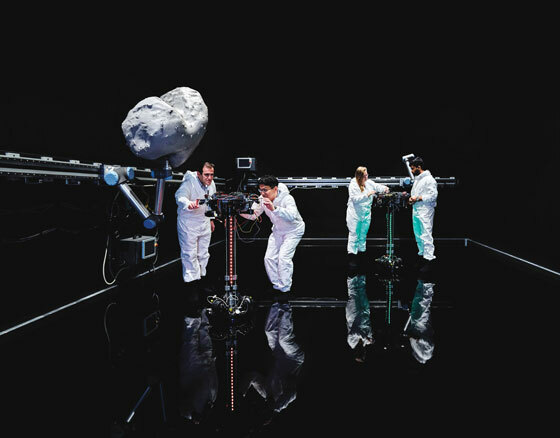 Each of the CAST moonshots aims to augment or improve the human experience. With that comes a particular awareness of the anxiety associated with shifts in the economy, labor market, and society that will accompany the future proliferation of autonomous systems. Aaron D. Ames is Bren Professor of Mechanical and Civil Engineering and Control and Dynamical Systems. Animashree Anandkumar is Bren Professor of Computing and Mathematical Sciences. Joel W. Burdick is Richard L. and Dorothy M. Hayman Professor of Mechanical Engineering and Bioengineering and Jet Propulsion Laboratory Research Scientist. Soon-Jo Chung is Associate Professor of Aerospace and Bren Scholar and Jet Propulsion Laboratory Research Scientist. Morteza Gharib is Hans W. Liepmann Professor of Aeronautics and Bioinspired Engineering; Director, Graduate Aerospace Laboratories; and Director, Center for Autonomous Systems and Technologies. Yisong Yue is Assistant Professor of Computing and Mathematical Sciences.